Veneers can transform your smile and make it dazzling, but many people worry, do veneers look fake? When they’re done right, they look completely natural, but there are a few tips you can follow to make sure you get the best-looking veneers you can. 1. Find an experienced dentist: Don’t be tempted to go for a lower price by using a dentist who’s inexperienced with the placement of veneers. Veneers are a cosmetic procedure, so you should seek a dentist who cares about cosmetic dentistry. Avoid any dentist who seems unenthused about helping you improve your appearance. 2. Pick a natural looking colour: If you’re getting veneers on all your front teeth, you can change the colour of your smile, but be careful not to go too white. Everyone wants whiter teeth, but be realistic. A white that’s far beyond your natural tooth colour may advertise the fact that your teeth aren’t natural. If you’re only getting veneers on a few teeth, you’ll want to match the colour to your other teeth as closely as possible. 3. 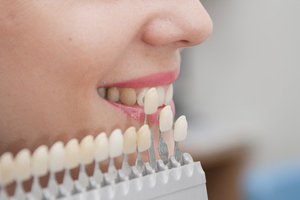 Whiten before you get veneers: Artificial materials like veneers cannot be whitened with whitening products or bleach. So, if you want to whiten the teeth that are not getting veneers, do it first. Once you’re satisfied with the colour of your teeth, choose your veneer colour. 4. Listen to your dentist: After you’ve found a good cosmetic dentist who cares about giving you a great smile, if he or she honestly advises you against a certain colour of veneers, or has a concern that something you want may not be a good idea, don’t demand that the dentist do things your way. Your dentist is an experienced professional who will be able to give you good advice about what will and won’t work, so consider their advice carefully. 5. Take care of your teeth: After you get your veneers, keep up with your dental hygiene. Follow your dentist’s care instructions and keep having regular checkups. This will help your smile look good and remain healthy.